How is it that so many Americans came to form an ardent attachment to the village of Venasque; an affection manifest in houses purchased for long stays within the quiet village walls, and the visit upon visit of friends, or friends of friends, from the states? Unless you have been told, this peculiar American presence is unapparent; you hear no English spoken among the occasional chatter of villagers in the streets. 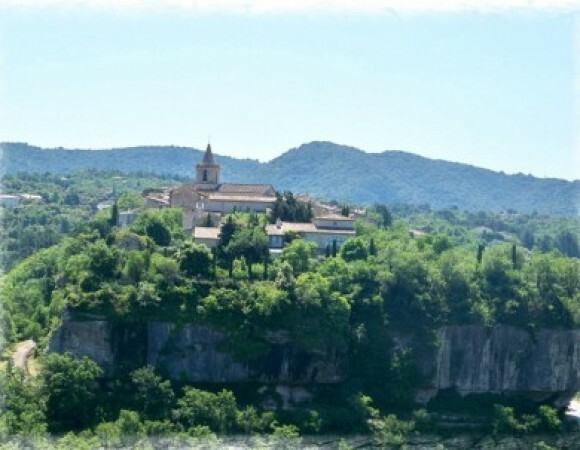 Seven miles east of Carpentras, and a six mile passage through a gorge to Gordes, Venasque is the former capital of the Comtat Venaissin, a county bordering Avignon that was part of the Papal Territory until 1791. Perched on an abrupt rocky spur of a thousand feet, the compact stone houses of Venasque line the Grand Rue, the one principle street only accommodating two-way traffic in certain sections, which rises a few hundred feet from a 15th century church to a small square with a foundation, where two ivy-festooned streets (one in photo above) lead up to an esplanade guarded by the remnants of two Roman towers. 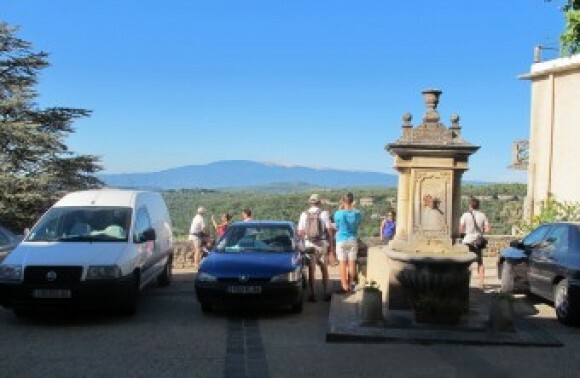 With a clear line of sight to the north to 6,000-plus feet Mont Ventoux with its bare limestone summit, the village seems to be in intimate conversation with the mythical mountain which never leaves the gaze of the villagers who speak as if it were sentient. As the Ventoux reassures, so the perch protects; thus, Venasque is a place that never feels hermetic or cramped, rather one is comforted by the feeling that you have reached a place where there is no impulse to look elsewhere. It is not a place where people travel through, and very few come to Venasque, as there is no viable commerce such as a bank, an atm/cash point, a pharmacy, a gas station, and there are no street side cafes. There is the hugely popular Remparts restaurant, and, within the last two years, a vibrant Friday evening market. In fact, Venasque could be said to have two unique seasons, one marked by the opening of the Remparts restaurant on April 1 (entrance pictured above), and the other beginning with its closing on November 15, when the village slumbers until the spring and at midwinter the houses are shuttered to the Mistral wind from the north. 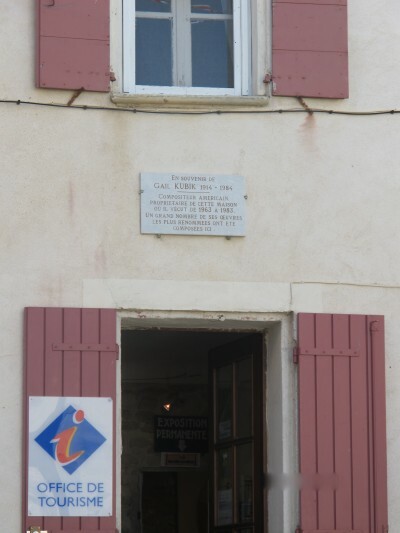 On the Grand Rue above the doorway to the village Tourism Office, a gray plaque looks down on passers-by announcing that Gail Kubic, the American composer, motion picture scorist and teacher, lived in this house from 1963 to 1983, and composed many of his works within. Kubic won an Oscar in 1951 for the score of a feature cartoon, and a Pulitzer the year after for his Symphony Concertante. He introduced Venasque to hundreds of Americans, one an American artist who moved to the village in 1980, and remains a resident today. A number of years later, a wave of Americans – hailing from New England, the midwest, and New York City – bought homes in Venasque, and in the last decade there have been purchases from families based in Atlanta and Dallas. And then six families from Portland, Oregon bought a house in the village which they time-share among themselves (pictured below). A son of the jazz musician Dave Brubeck, a musician himself, bought a place in the center of the village. Some of these owners rent out their houses during the year, or they lend them to vacationing friends. Each American owner draws friends and associates to Venasque, while the small hotels and bed-and-breakfast establishments, such as the Maison aux volets bleus, report good trade from American tourists. Within the village, there are about two hundred inhabitants (population of the commune of Venasque is 1200). 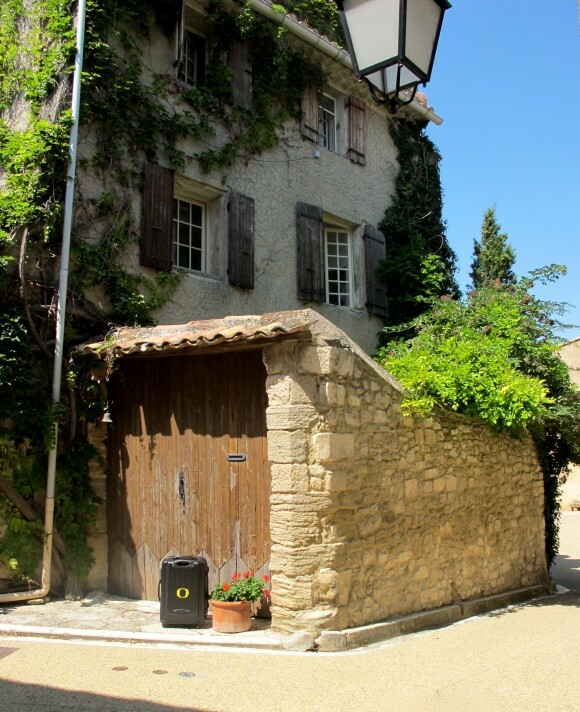 Certainly, there are more Americans per capita owning houses in the village of Venasque than any other village in the Vaucluse, or perhaps any other in France. 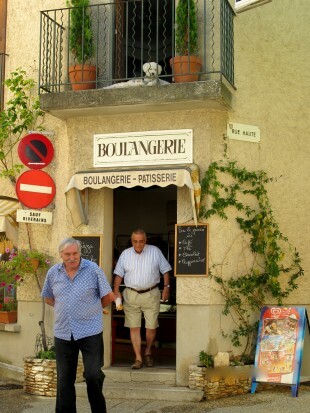 Yet, one can stroll the quiet streets in Venasque and never sense anything more than a typical Provencal atmosphere, so blended into the landscape are the Americans when they make Venasque their home. 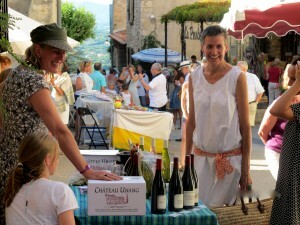 Venasque takes on a festive air every Friday evening with an open air market launched two years ago by the Mayor. 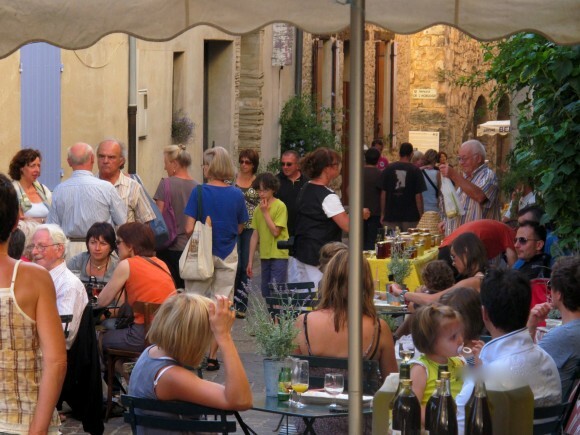 Two pop-up street cafés, which serve wine, drinks and amuse bouches on the Place de la Fontaine, are run by the Café La Fontaine and the Maison de Charme La Fontaine, which serves wines of the nearby Chateau Unang. 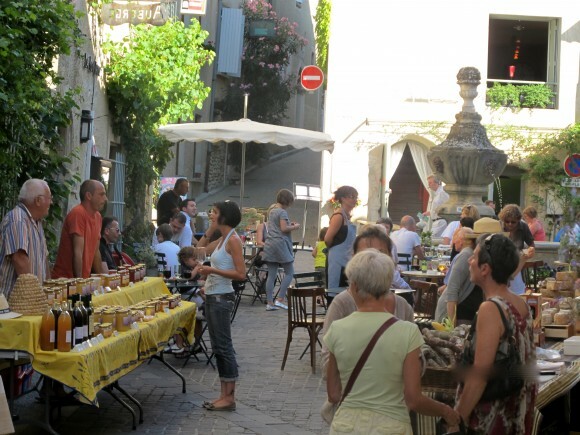 Stalls along the upper part of the Grand Rue offer vegetables, cheese, charcuterie, wine, honey, jams, soaps, crafts and art. Running every Friday from June to Sept. from 5:00 p.m. until 9:00 p.m., the open air market has the feel of a gathering of friends. Smaller and more social than the other farmers markets, the Venasque market has been a huge success in drawing visitors in the region as well as animating the village with cheer. Friday Market June 15-September 15, 5:00 to 8:00 p.m. 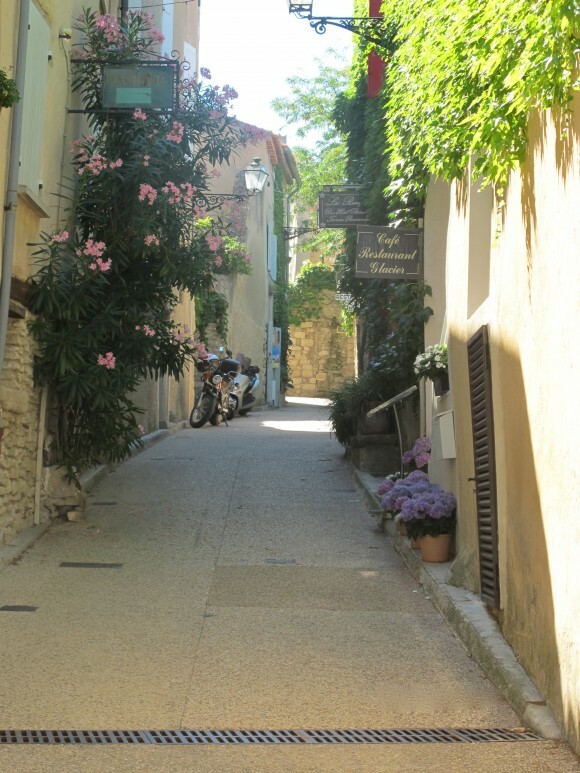 Many hold the conviction that there are villages in Provence that would be overrun by visitors and tourists if word go out about their idyllic nature. While this passage may flatter the vanity of self-regarding snobs by not uttering the name of their “favorite village,” no villages are ever so threatened. Secluded villages are hermetic by nature: few places for sale, few places to stay, few places to eat, few places to shop and few places to linger. Upon a ritual 15 minute tour, random visitors flee out of disinterest. 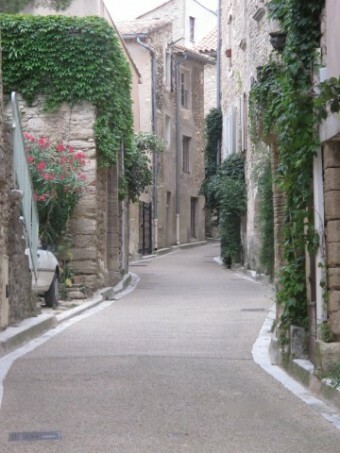 A final observation: ‘upscale tourists’ in the Vaucluse have no desire to run over anything. Rather, the well-heeled desire to run away, to cloister themselves in isolated establishments hidden from public view, interlaced among the garrigue, olive orchards and vineyards and exist as bohemians. As for Venasque, there is no risk of it ever being overrun; Americans have already taken up their places, and are lov’n it. 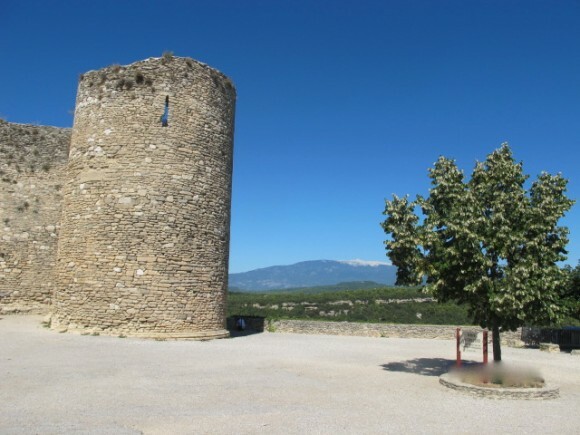 Note: Interested in a house in Venasque? There are about ten properties in the village center for sale. This entry was posted in Reportage and tagged Venasque. Bookmark the permalink.